Having dictionary app on your iPhone and iPad is a great thing, and it can help you in many situations. Therefore, it is necessary to have a dictionary on your mobile, and it will allow you to use it anywhere. In this regard, we are providing you the details of different dictionary apps to make your decision. You can read about different useful dictionary apps in below and can choose anyone according to your preference. 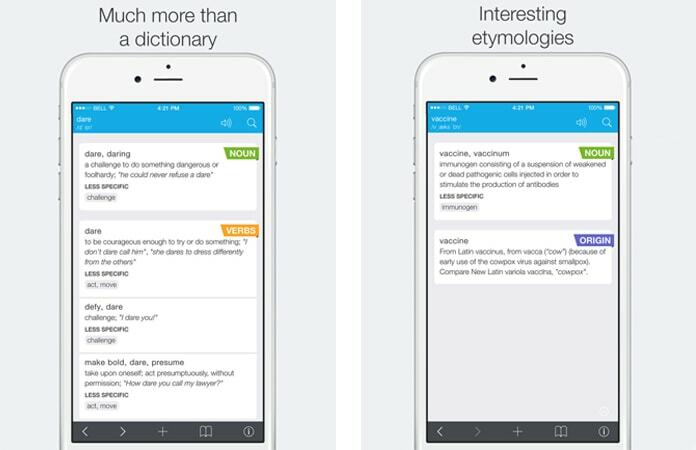 Have a look at the best dictionary apps for iPhone, iPad and Android devices, with their complete description. These all dictionary apps are useful and well admired by the users. 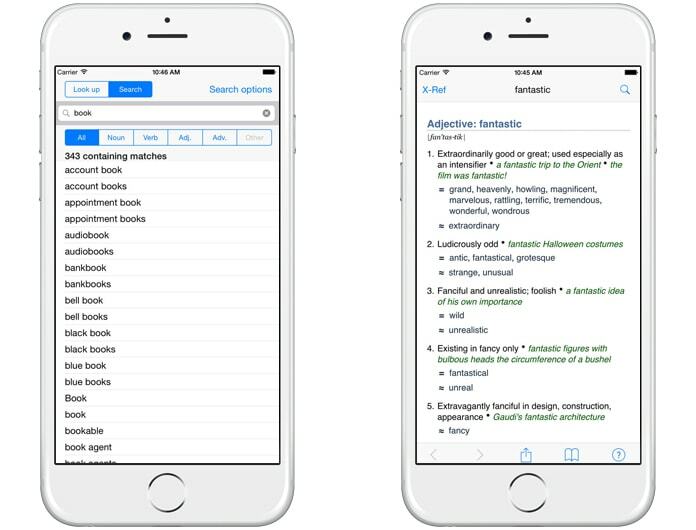 So, continue reading this post if you want to know about the best dictionary apps for iPhone and iPad. This is a complete dictionary app and it lets you take all benefits from it related to your vocabulary needs. You are free to use it anywhere and can run it offline. It is the right app to improve your English and provide you enough sense of sentence structures. You can read different articles, can know the meaning and origin of any word and can also translate English words into more than 45 languages. All words and their meanings are in details and easy English to understand. In short, you should install it right now and forget everything about your grammar and translation worries. If you are looking for an advanced dictionary app which comes with 5 million words, this is the right app for you. It offers audio pronunciation in major English (US, UK & Australia) and others. It is getting popular with time and covers 5 million words, 591,700 entries, and 335,000 relations. 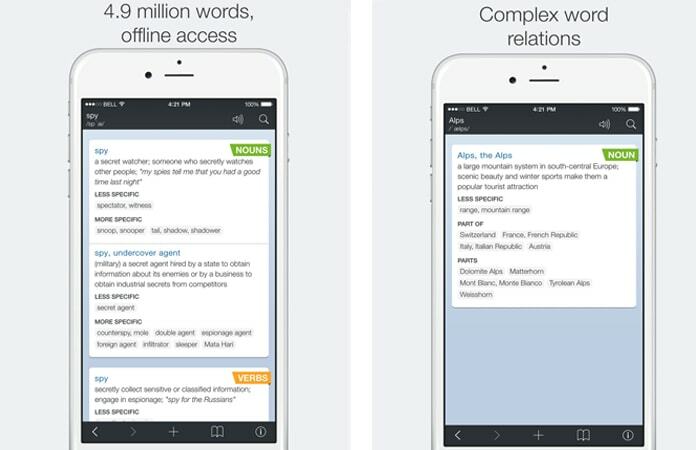 All these things make this app really a comprehensive dictionary app, and you can efficiently use it and enjoy your reading and learning sessions. So, never ignore the deal and install it on your iPhone today and start enjoying its fabulous features. This app is another dictionary app for your iPhone, and it is inexpensive. It is well known for its interface, and also offers full access to each word with its complete details. This is a light app and can be used easily and effectively. It offers various features to maintain your experience with the dictionary amazing and comfortable. Some of its more useful features are its 4.9 million words and 591,700 entries, its offline use, its 134,000 pronunciation guides, its audio pronunciation in British, American & Australian origins. Additionally, it offers editable history and bookmarks feature which is very helpful to access the required word and other things easily and in a quick manner. WordWeb Dictionary is a dictionary app which is both for iPhone and iPad. It is an English dictionary which is offering 285,000 words, 225,000 words sense definitions for proper understandings, 85,000 text pronunciations, and more than 70,000 usage examples to convey all necessary information to you. Also, it is famous for its various synonyms options, offline use, similar and related words feature which helps you to know the required words. Thus, it would be a great deal to install it on your iPhone or iPad completely free. One of the best dictionary apps for iOS and Android devices is iTranslate app. This app is translator/traductor and dictionary, and you can download it for free. 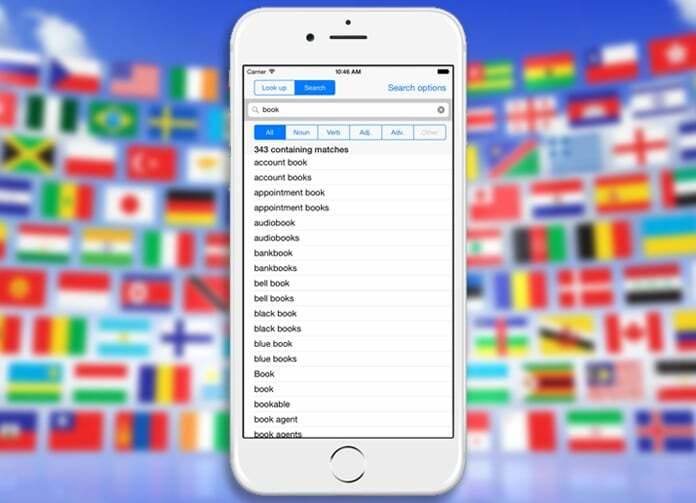 If you are looking for multilingual (more than 100 languages) dictionary and translation apps for iDevices, then this app is the right for you. The Offline Mode of this app allows you to translate abroad without having to pay expensive roaming charges. 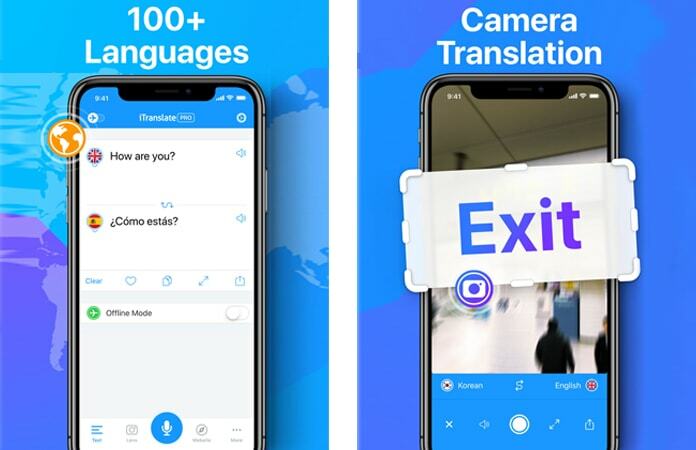 iTranslate allows you to switch between different dialects and it also allows you to copy words and paste any in any app and share words using Facebook, Twitter, Messages and Mail. This app is compatible with iPhone, iPad, iPod touch, Apple Watch and Android devices. 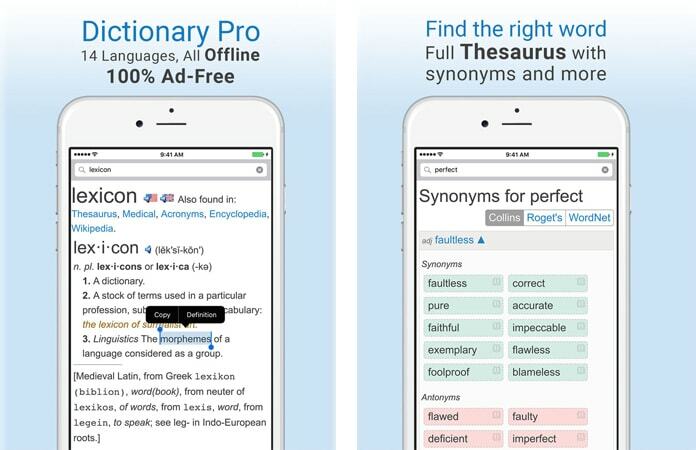 We hope that you liked our list of the best dictionary apps for iPhone, iPad and Android Devices. Don’t forget to like, share and leave your comments in the section below.